I feel I owe an explanation for how quiet I’ve been this week. Since we cut way back on naps (none most days and a maximum of 30 minutes on the days he sleeps), Little Man has been sound asleep by 8pm each evening. After the past couple of months of later and later bedtimes, it’s a wonderful novelty. Except…remember our craft table? It’s allowed me to rediscover the crafts I used to love, before finger painting and papier mâché took over! 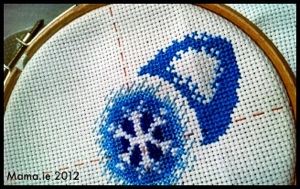 This week I’ve been remembering just how much I love to cross-stitch. I dug out a Christmas decoration kit that I bought a few years ago, and only ever managed to make one decoration from, and I’ve started stitching one of the patterns. I figure by starting in August, I have some hope of finishing it by Christmas! Ah the memories 🙂 I haven’t done any cross stitch in ages. I’ve been putting my crafty time into knitting for the last year or so and remembering just how much I enjoy it. Well that’s all I did for about a month after we organised the craft table Ellie. I couldn’t decide what to start with! I keep promising myself that when the fall comes, I’ll get back to crafting too. 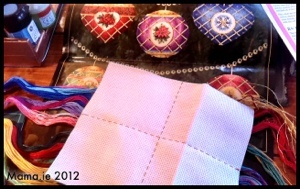 I have bins full of wool, cross-stitch supplies, card-making supplies, and stained glass supplies. Lots of interests, just no time to do much, it feels. It’s so hard to find the time Tammy. I totally understand. What I’ve had to realise is that I can’t find time every evening – just once or twice a week. So once I resigned myself to the fact that a project is going to take FOREVER, it was a bit easier to get started. That’s a good attitude. My poor sewing machine is gathering dust as are the books of cute baby clothes/toys. Because I don’t have the motivation to drag it out and just start something at least! Like you I just need to realise that i can only do things in fits and starts and won’t get big projects done in a weekend. The loss of nap is a sad time indeed. Jill recently posted..Sweetcorn Fritters. Inspired by Gino, made by Mark.